Last time on the DROP method of tactics, I talked about Removal (http://cschess.webs.com/apps/blog/entries/show/14228365-r-is-for-removal-). The DROP method is an acronym for the basic kinds of tactics. It is meant to remind you not to drop your pieces and help you get your opponent to drop theirs. The third category in the DROP method is Overload. See, D is for Discovery, R is for Removal, and O is for Overload. The last category I will discuss in a later newsletter. Overload is my way of describing a Double Attack. The idea of Overload appealed to me, not just because it helped create the acronym, but also because it conveyed the idea of streatching the defense beyond its limits. Similar to Removal, it incorporates a number of tactical ideas. For example, Battery, Fork, Over-Worked Piece, and Skewer can all be considered different kinds of Overload. The main idea is to use multiple pieces (as in a Battery) or multiple threats (as in a Fork) so that the defense cannot respond to all in one move. Here is an example from one of my upset wins over Jeff Fox. Jeff and I have played each other more than any other opponent. He is the number one opponent on my list, and I am the number one opponent on his list. Early on in the match-up, he was higher rated, and I would get an upset only because he got in time pressure. This is one of those games. Jeff gets low in time, and I move quickly to keep his clock running but fall into a common Overload tactic. Sometimes the Overload tactic is a quick shot that just appears. However, it often occurs after a combination of moves that the offense uses to apply forces to a target until the defense runs out of resources to hold it. When more attackers than defenders aim at a target the Overload is achieved. Which one did Jeff find? Unfortunately, Jeff had used too much time to get to this position when I walked into a Knight Fork (26. Nd6+). The Knight can Overload the black defense in one move with a triple attack. The black King has to get out of check, the black Bishop is en prise, and a black Pawn is en prise. The black King can get out of check and protect the Bishop, but he cannot do all three. 1. 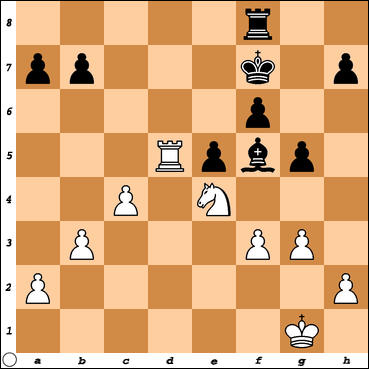 Nf3 Nf6 2. g3 d5 3. c4 c6 4. b3 g6 5. Bb2 Bg7 6. Bg2 O-O 7. Bh3 14. Re1 e6 15. f3 Bf5 16. Nf2 g5 17. Qd2 c5 18. Rad1 cxd4 19. Bxd4 Bxd4 20. Qxd4 Qxd4 21. Rxd4 Rad8 22. Red1 Rxd4 23. Rxd4 e5 24. Rd5 f6 25. Ne4 Kf7 26. This was the event under which the CO Closed, CO Challenger, Scholastic Closed, Scholastic Challenger and CO Senior Open were submitted. Site: Masonic Lodge, 455 El Paso Blvd, Manitou Springs. Entry fee: $30 if rec’d by 12/1, $35 at site. $8 off EF for Juniors, Seniors, Unrated. Prizes: Cash prizes per entries. Registration: 8:30 - 9:30, Rounds: 10, 4; 9, 3. CSCA membership required ($15, 10 for juniors/seniors), OSA. I am a collector rather than a player for the greater part but this morning I received a call from a California collector referred to me by Floyd Sarisohn of CCI interested in seeing my collection. Bob and his wife Larisa are in Colorado Springs presently and would be interested in seeing any chess collections from anyone in your area (I am in Littleton/ Denver). If you know of any chess set collectors there, that might be willing to show their collections, please contact me as soon as possible either by email or a direct phone call and I will pass on the information to them.